Happy Birthday From Struggle To Strength. It was 5 years ago on November 10, 2011. I did however find a website called blogspot. I created an account and I called it Eric’s Daily Struggle. I remember choosing that name because everyday was a struggle for me. Every day I struggled with the thoughts that raced through my mind. The Royal Rumble that was going on inside my head between good and evil. Wanting to stop using and continuing to use. With wanting to die but deep down inside wanting to live just a little bit more. So by taking that suggestion 5 short years ago my personal journal has turned into my blog. After a couple of years of struggling with staying clean. I finally made a decision to get off the fence and stop struggling. I realized that it was all in the way I viewed my life and my circumstances. 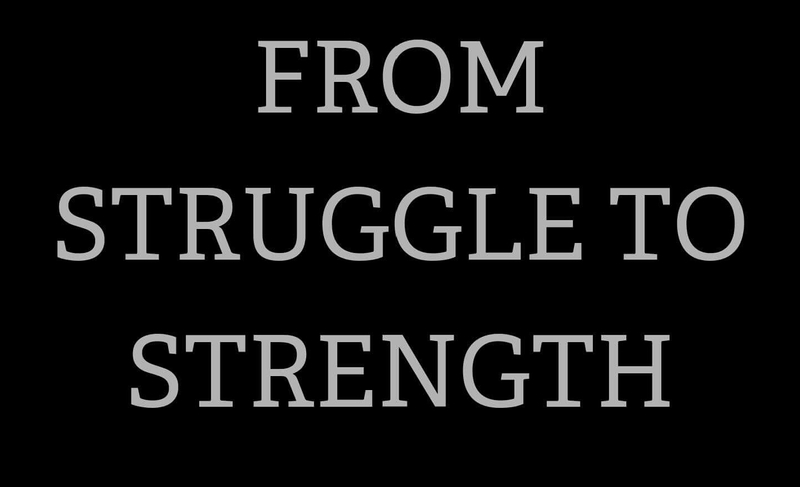 I decided to fight for my life and so I changed the name from Eric’s Daily Struggle to From Struggle To Strength. I became willing to do the work necessary to stop the daily struggle and to become strong enough to just say no and to actually mean it. I am truly grateful for all the people I have met along the way as a direct result of my blog. I am grateful for the therapeutic value of writing down thoughts for it has taught me some very valuable lessons. I never realized when I began this journey that my words would help anyone not even myself and sometimes I still feel like I am not suited to be of any help by sharing my journey but I know that, that is not true. I know that the same way I get help from reading and hearing other people share their journey, my words have the same healing effect. I am thankful that I did not give up way back then. My blog has helped me to grow and in turn I am able to help others to grow as well. So with that being said. I want to wish my blog a happy birthday. I want to thank my readers who comment on my posts too. I couldn’t have made it without all of your support and encouragement. Here to the next 5 years and beyond. ← WHO AM I TO JUDGE. Karen I thank you for always sharing with me your journey. I have prayed many nights that K would be alright and you would begin to experience the happiness that you deserve. It saddens me to hear that you guys are at the fork in the road. Unfortunately it happens all to often. One thing I learned is that I and You also deserve better. Sometimes our higher power sees that people in our lives are not ready and he doesn’t want them to interfere with the plan he has for us, so he removes them so we can continue our forward motion. I am grateful that my writing was able to bring you hope. I am grateful to be able to share with you my story. Keep the hope Karen. Keep believing. We are proof that recovery does work. Thank you for being such a wonderful friend. God’s Continuing Blessings Eric, as you grow, and share, helping others grow. You have come a long ways, but God is not finished with you yet. He has great plans for you to accomplish, that can only be completed as He leads, and you follow, in His Strength. Good morning George. Thanks. I agree. God’s grace has been amazing and he has more work for me to do. I will continue to practice living God’s will for me and not my own. I am gratefully looking forward to the future as well. Have a fantastic day brother. Thanks brother. How are you doing? Praying that all is well with you and your family. That’s great brother. Keep trying. You got this. Glad to hear that everyone is doing well. Have a great day. Peace and blessings.